The weekend is here and you find yourself with nothing to do. Then you get a call from your daughter, asking if the kids can spend the afternoon with you while she does her errands. As a devoted grandparent, you quickly agree — it's an impromptu reunion with your apos! These unplanned visits, while welcomed as delightful surprises, also means you would have to put together a merienda that is delicious, but quick and easy to prepare. Spaghetti is always a crowd pleaser, especially with little children. It's also a flexible dish, allowing you to work with what you have available in your pantry. Spaghetti used to be thought of only for big parties. Now, with a little Del Monte ingenuity, it can be prepared as a quick and economical merienda with the Luncheon Meat Spaghetti recipe. This delicious recipe eliminates the additional steps of defrosting and sautéing ground beef. Simply open a can of luncheon meat and cut into cubes! 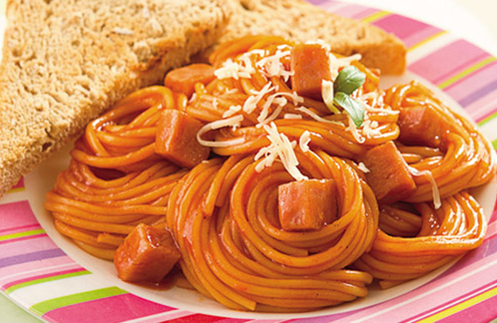 Luncheon meat in spaghetti sauce is similar to having bits of hotdog — another kiddie favorite! You can make this easy recipe your own by exploring different kinds of luncheon meat — some are packed with a cheesy filling while others will have a spicy variant. Choose which type will best fit the palettes of your guests. If you're serving it to your apos, make sure you have plenty of grated cheese and toasted garlic bread to go around. Reunions, no matter how big or small, deserve a delicious dish to compliment the fun and love around the table. This spaghetti may even become a special request at your next mini-reunion.